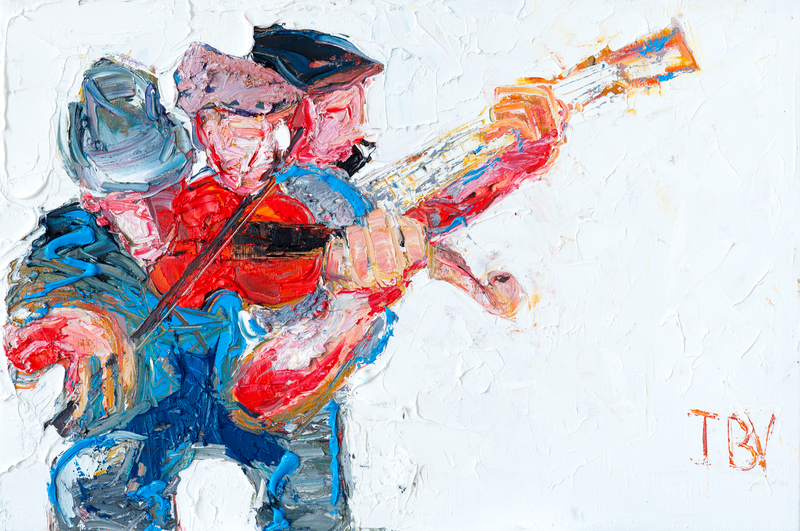 Born in Armagh in 1941, JB Vallely is one of Ireland’s foremost painters. First encouraged to paint by his father, he attended night painting classes with him as a teenager and held the first public exhibition of his work in 1958. A year later he enrolled at the Belfast College of Art and later studied at the Edinburgh College of Art. His work was soon recognised by art critic Kenneth Jamieson who described him as ‘a student of considerable promise’ and in 1963 eight of his works were included in the New York World Fair. Soon after this JB Vallely embarked on a tour of Spain and Morocco where he immersed himself in the music, religious festivals and culture of those Mediterranean communities. A keen musician, JB Vallely founded the Armagh Pipers Club in 1966 and is today heavily involved with the Armagh Athletics Club. These pursuits are often portrayed in his works with fiddlers, pipers and football players making a regular appearance. Using palette knives and thick, energetic brushstrokes JB Vallely has the ability to create a lively atmosphere which symbolises the spirited characteristics of the subject matter. With over forty solo exhibitions spanning his career to -date, the paintings of JB Vallely appear in the collections of major galleries and universities in over thirteen countries.